My lips are chapped which means I am trying new lip balms. Pretty much I never have one when I need one so I figure when I buy one I may as well try something new. I have tried chapstick, Burt’s Bees, Vaseline, Carmex, Blistex, Neutrogena… this list goes on and on. 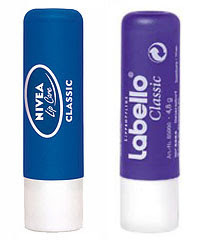 My favorite though is Labello. What, you say you have never heard of labello? There is one of two reasons. If you are American, it is because you can’t get it here and you didn’t know how great it was when you saw it on your vacation. It may also be because it sometimes is disguised as Nivea lipcare. This last fact I learned only today. This is sad because don’t you know it, New Zealand sells Nivea lipcare products! I even bought one thinking “Gee, doesn’t this look just like my favorite brand of lip balm? ” At least I have the one. Had I known I would have stock piled. Now I just have to wait for someone to take a trip… Hey B, didn’t you say something about a trip in your near future. I am officially asking you to be on the lookout. Don’t be fooled by the pretty colors, blue is the best. I may be heading down-under in a couple of months — no definite plans yet. Either that, or the entire worldwide financial industry will collapse. Not sure which – I’d give it about 50-50 at this point….